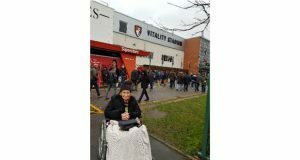 Dedicated Cherries Fan Proves It Is "Never Too Late"
A lifelong football supporter got to experience the VIP treatment at their beloved club, proving it is never too late to tick activities off a bucket list. Rosalie Carter, a resident at Bupa The Lindsay Care Home, on Lindsay Road, Poole is a well-known avid AFC Bournemouth supporter, having supported them since the 1960’s. Since then, Rosalie has supported them through their best moments; when they reached the premier league and their worst moments, donating money to her beloved club in their times of financial crisis. She last attended a match two years ago due to declining health. The staff at Bupa The Lindsay Care Home decided to take matters into their own hands and contacted Bournemouth football club who happily supplied tickets to their most loyal fan. Rosalie not only experienced a 2-0 win for Bournemouth against West Ham but met Bournemouth Chairman Jeff Mostyn and was invited to the Man of the Match presentation.